I love this review of Susanna Calkins’ debut novel! Definitely adding it to my lengthy reading list. 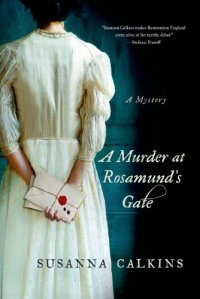 I picked up A Murder at Rosamund’s Gate at the library–on a whim, which is how I pick out a lot of my library books. And I wasn’t disappointed. Susanna Calkins’ debut mystery had me guessing right up to the big reveal at the end. I had picked practically every character in the book as a suspect before the end, and I was still surprised to learn who the killer was. This is a book I highly recommend for anyone who loves a good mystery, Restoration England, and above-stairs/below-stairs intrigue.